WegoWise Inc., which provides energy analytics to private property owners and public housing entities, last week launched WegoScore, a rating system that assesses buildings in three areas, energy, water and carbon and then spits out a score between one and 100. >” […] “We are focusing on a universal approach with meaningful reductions,” WegoWise founder and CTO Barun Singh said of the platform. With the water crisis in California and with 39 percent of carbon dioxide coming from buildings, property owners and public housing agencies are making energy-saving retrofits and want to market what they’ve done. Those buildings that reach a high rating are issued certificates and decals to let the world know they are more efficient. Maloney Properties Inc., a Wellesley-based real estate management, sales and construction firm with 350 buildings, is featuring its decal proudly. Other area companies include Peabody Properties in Braintree and Homeowners Rehab, based in Cambridge. The score not only brings awareness to a building’s efficiency, it also provides a way for property owners to market the value of the work completed in their buildings to perspective tenants who are concerned about the environment, Singh said. And the stickers are a fun way to market their accomplishments. After using WegoWise, Maloney Properties was able to find $2.5 million in 2014 retrofits and expects to save 10 to 20 percent on utility costs related to the retrofits annually. John Magee, an assistant facilities director at Maloney, said the real estate company has been looking for a way to market the value of its properties. And now, the WegoScore will enable it to do that. With the $4.9 million in funding it has raised from Boston Community Capital, WegoWise was able to build a portfolio of 23,000 multifamily buildings covering more than 600 million square feet. With all of the data that WegoWise has collected since its launch in 2010, coming up with a rating system would be a simple solution, right? Not exactly, according Singh. Launching WegoScore was an expensive and lengthy process for the 25-person company, he said. Before launching the rating system, Singh said he wanted to be sure that had enough data to come up with a score that was meaningful. “The end result is a straight-forward algorithm,” he said. 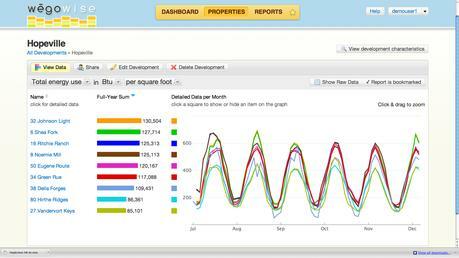 The WegoScore is currently only available for multifamily buildings, according to the company. Scores will be refreshed on a weekly basis and stickers are awarded twice a year. This entry was posted in Building Science & Construction, Energy Efficiency, Finance, Green Building & Architecture, Renovations and Retrofits, Sustainable Development and tagged Energy Audit, Energy Efficiency, Energy Management, Engineering, Green Building, HOA, Property Management by duanetilden. Bookmark the permalink.